Earlier during her shift, she'd taken a call about a young missing woman who had been to hospital after self-harming. It was during their chat that she realised she'd just helped the same person who she'd taken the call about while at work. "I get calls like this quite often with people who are in distress or who are feeling suicidal, but I've never been in a situation where I've been with it face-to-face," Megan tells Radio 1 Newsbeat. 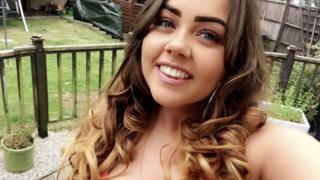 Megan, from Weston-super-Mare, says she didn't tell the teenager that she already knew who she was but instead tried to comfort her. "I did tell her I worked for the police which seemed to reassure her and made her feel a bit better. "I was comforting her the best I could and telling her it wasn't the best thing to do. I had my arm around her but I didn't tell her I knew her." Megan, who has worked as a call handler for two-and-a-half years, says she hasn't been able to speak to the teenager again but hopes she is okay. She says she enjoys her job because "every day is different" and she feels "proud" to have been given a bravery award. "There are some calls like this that do stay with you and do upset you. It can be quite difficult but you just have to remain as professional as possible." Avon and Somerset Police said: "Megan saved the life of this young girl through courage, composure and a great deal of caring." If you've been affected by any of the issues discussed in this article, you can find help at the BBC Advice pages.